Derbyshire and Northants were frustrated by heavy rain that prevented any play in their NatWest T20 Blast North Group match at Derby. 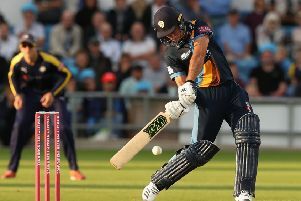 It was not the first time the weather has ruined a T20 game between the two teams — last season’s fixture at Chesterfield was called off without a ball bowled and this latest washout is the fourth in Derbyshire v Northants matches. The no result leaves the North Group wide open with Northants moving up to 10 points from eight games while Derbyshire are one point behind, having played the same number of matches. Derbyshire Falcons will be hoping for better weather on Sunday when they take on local rivals Leicestershire Foxes at Derby in a game starting at 2.30pm. Northants Steelbacks are next in action on Tuesday evening against Birmingham Bears at Northampton.